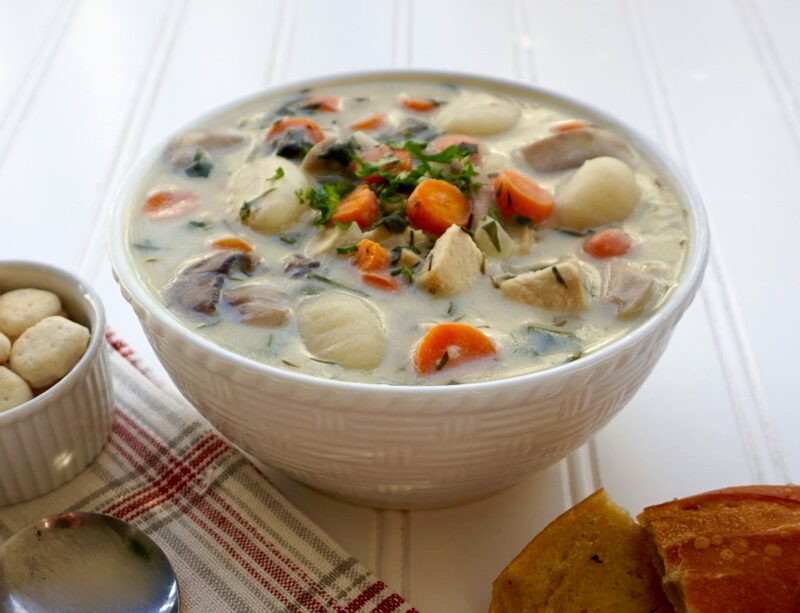 Turkey Gnocchi Soup is a creamy soup with lots of veggies. Are you waking up this morning with a lot of leftover turkey? Sure, you can make sandwiches again or reheat it in gravy if you feel so inclined. 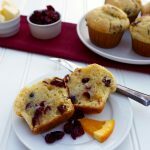 Or you can use it to make something that will not feel like you are eating leftovers! 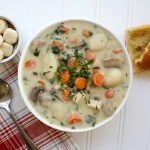 Turkey Gnocchi Soup is a creamy, hearty soup that is different from anything served at Thanksgiving. 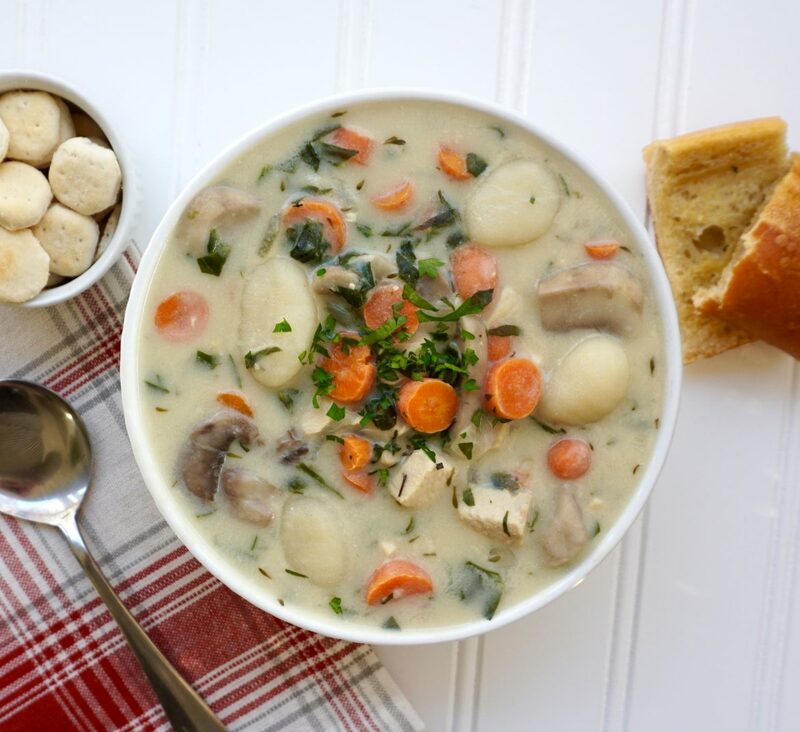 Turkey Gnocchi Soup is creamy, full of vegetables, and enhanced by thyme. 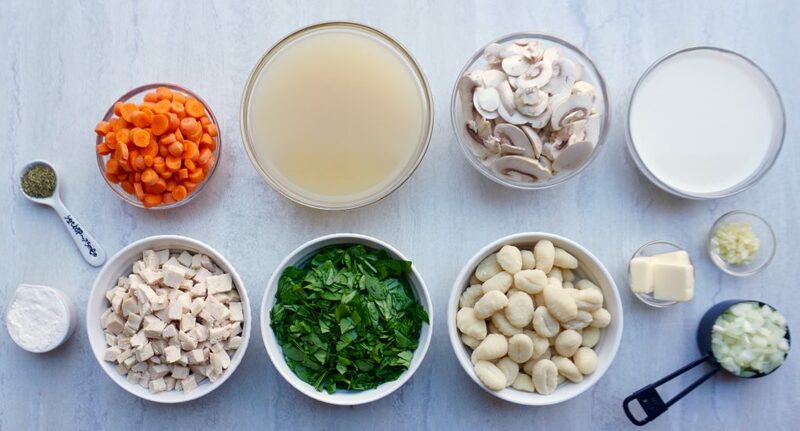 Make this soup and you will be happy next week! Melt the butter in a large stock pot. Add the mushrooms and cook over medium low heat for 5 minutes until the liquid starts to release. Add the onions and garlic and for for an additional 3 minutes, stirring occasionally. 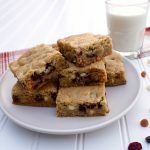 Add the flour to the pot and mix in thoroughly with a spatula. Slowly add the chicken broth, one cup at a time, stirring with a whisk to ensure that you do not have any lumps of flour. Heat over medium heat until it begins to bubble and thicken. Add the carrots and thyme and simmer for 5 minutes. Add the turkey, spinach and gnocchi. Increase the heat to high until the soup comes to a boil. Reduce the heat to medium low and simmer for 5 minutes. Add the half and half and simmer until heated through.